employee health, wellbeing, engagement and productivity. Heightened job and life satisfaction, producing increased employee engagement and reduced turnover. (1) Taking a Mindful Approach to Business Can Improve Performance, Sodexo's 2015 Workplace Trends Report. Retrieved 3/22/2016. (2) At Aetna, a CEO's Management by Mantra, New York Times, 2/27/2015. Retrieved 3/22/2016. Programs may be delivered as multi-week course or multi-day workshop formats, live or blended live/online environments, onsite or offsite. ​Our programs can also be tailored for offsite meetings and executive retreats. Contact Us to Explore What a Mindfulness Training Program Can Bring to Your Workplace! An Introduction to Mindfulness course, this 8-week program introduces both formal and informal mindfulness practices, covers the basic science of stress and wellbeing and provides a good foundation for integration into work and life. This program is ideal for the workplace and helps employees connect with their work and lives in a more focused and purposeful way. 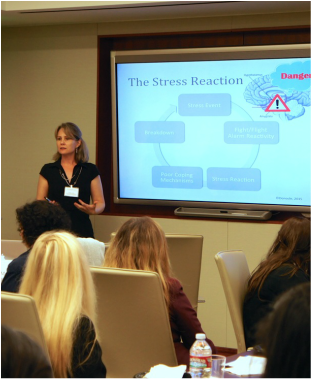 The full 8-week Mindfulness-Based Stress Reduction program can be offered in the workplace for those who want a more in-depth training in mindfulness or who need a more intensive stress reduction regimen. The most empirically-supported mindfulness training program available, this class can transform the way you live your life. SIY is a mindfulness-based emotional intelligence program. Delivered to organizations in a 2 day or 6 week format, SIY helps individuals more fully "optimize" their performance, leadership and wellbeing in both their personal and professional lives. SIY originates at Google and is now offered through public programs and organizational engagements around the globe.